Navigational aids in the Sound of Islay. 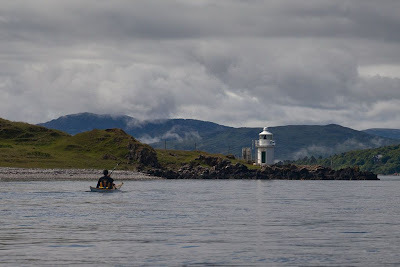 The tide in the Sound of Islay whisked us south to the Carrag an t-Sruith lighthouse. 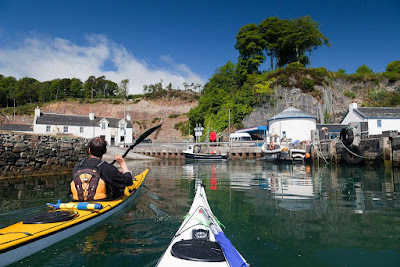 Unfortunately it was not big enough to have its name painted on the side, thus somewhat hindering its navigational usefulness. Useful though white painted lighthouses may be to navigators, we noticed a much more interesting building on the far side of the Sound, which was also painted white. This one is quite clearly identified by having its name painted on the side, in large black letters. This makes it an incredibly useful navigational aid. 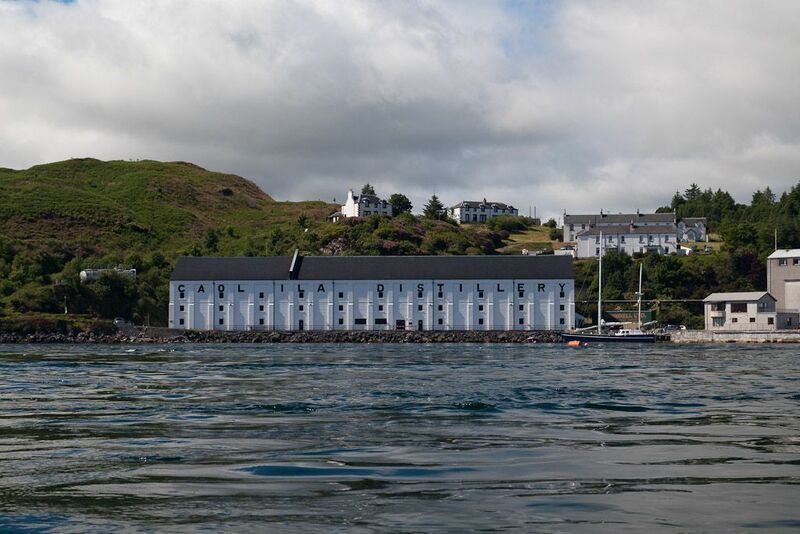 Not only that, the building serves another purpose, it is where one of the spirits of Islay is distilled from base grains of fermented barley. 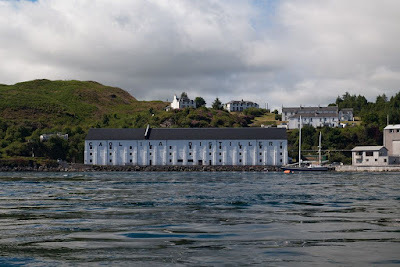 This is the spiritual home of the sublime Caol Ila malt whisky, which we had enjoyed just a few hours before! I am not sure if it was the powerful tide or the heady vapours emanating from the large white building but Phil seemed to loose all sense of direction and veered off into mid channel. 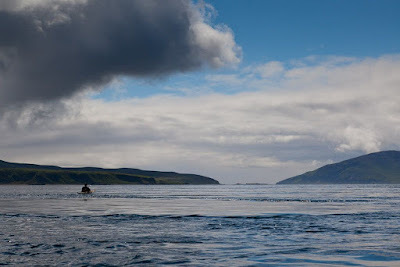 He very nearly missed the turn off into the narrow mouth of Port Askaig Harbour. 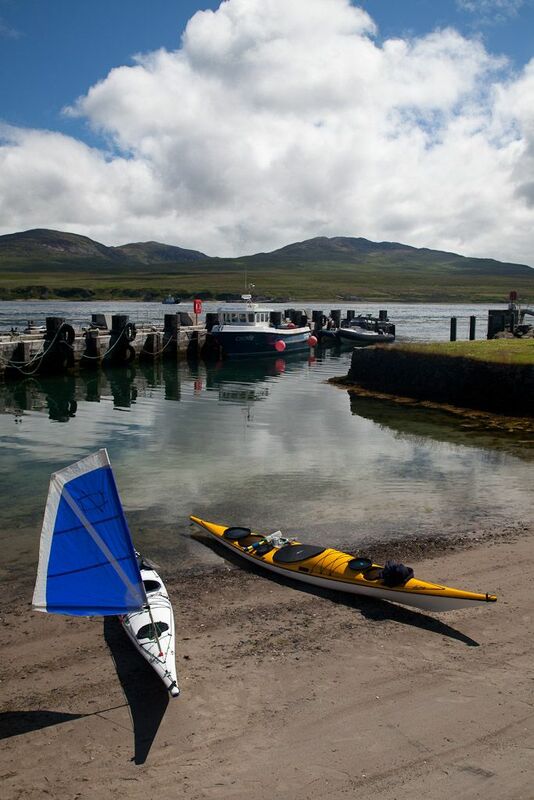 We had completed a great paddle on the north coast of Islay and Loch Tarbert on the west coast of Jura. Maybe it was not the one that we had originally intended but it was one from which we had returned safely.